Fjorn Scandinavian: Red is back. 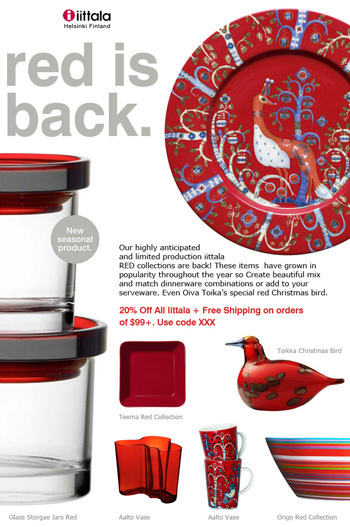 Our highly anticipated and limited production Iittala red collections are back! Create beautiful mix and match dinnerware combinations or add to your serveware. We also proudly carry Jouliana, Oiva Toikka's special red Christmas bird. Beautiful red things from Finland! 20% all Iittala plus free shipping on order of $99+. Use code IT10.